For over one hundred years millions of people have trusted the established news media. However, millions of people are now abandoning the mainstream news in favor of online alternate media, since these online news sources are typically more concerned about objective reporting than profit margins. The Bible says that the love of money is the root of all evil (1 Tim. 6:10), so the less money is an issue in reporting, the better. But there's more than truth and money at stake. Few people realize that the US media has been controlled by a small but super wealthy group of men. To them, money is just a means to obtain more power and control over the masses, so the corporate media is a tool they use for propaganda and mind control. Jesus said to beware of false prophets that come in sheep's clothing but inwardly are ravening wolves (Matthew 7:15). Today, we can easily find false prophets on corporate controlled TV. Whether the newscasters know it or not, the information and views they are reading are often filled with lies, deception and propaganda. Thus, it takes a conscious effort to block out the lies, seek out the truth via the Bible and independent media sources and learn to see through all the propaganda. Control of the US media is well documented for over 100 years. Below are a few examples. This history is mainly about journalism in the US. Similar stories can be found regarding corporate media in other parts of the world, especially if it relies on the US corporate media for news feeds. "This policy also included the suppression of everything in opposition to the wishes of the interests served. The effectiveness of this scheme has been conclusively demonstrated by the character of the stuff carried in the daily press throughout the country since March, 1915. They have resorted to anything necessary to commercialize public sentiment and sandbag the National Congress into making extravagant and wasteful appropriations for the Army and Navy under false pretence that it was necessary. Their stock argument is that it is 'patriotism.' They are playing on every prejudice and passion of the American people." Begun in the 1950s, Oeration Mockingbird was a secret campaign by the CIA to influence major US newspapers and TV organizations. It recruited leading American journalists into a network to help present the CIA's views, and funded some student and cultural organizations and magazines as fronts. As it developed, it also worked to influence foreign media and political campaigns, in addition to activities by other operating units of the CIA. In 1961 at an address to American newspaper publishers, President John F. Kennedy spoke of a huge, evil conspiracy that he had become aware of as president of the US. He was assassinated 939 days later. "For we are opposed around the world by a monolithic and ruthless conspiracy that relies primarily on covert means for expanding its sphere of influence–on infiltration instead of invasion, on subversion instead of elections, on intimidation instead of free choice, on guerrillas by night instead of armies by day. "It is a system which has conscripted vast human and material resources into the building of a tightly knit, highly efficient machine that combines military, diplomatic, intelligence, economic, scientific and political operations. "Its preparations are concealed, not published. Its mistakes are buried, not headlined. Its dissenters are silenced, not praised. No expenditure is questioned, no rumor is printed, no secret is revealed." "But I am asking the members of the newspaper profession and the industry in this country to reexamine their own responsibilities, to consider the degree and the nature of the present danger, and to heed the duty of self-restraint which that danger imposes upon us all"
In 1991 at a Trilateral Commission meeting, David Rockefeller, thanked the mainstream press for helping the global elite set up their new world order quietly without disclosing the process to the masses. "We are grateful to the Washington Post, the New York Times, Time magazine and other great publications whose directors have attended our meetings and respected the promises of discretion for almost forty years. It would have been impossible for us to develop our plan for the world if we had been subject to the bright lights of publicity during those years. But, the world is now more sophisticated and prepared to march towards a world-government. The supranational sovereignty of an intellectual elite and world bankers is surely preferable to the national auto-determination practiced in past centuries." Just as prostitutes make money from illicit services rendered with their bodies, so presstitutes make money from illicit services rendered with their words. Dr. Paul Craig Roberts wrote, "The US print and TV media (and NPR) whore for Washington and the corporations. Reporting the real news is their last concern. The presstitutes are a Ministry of Propaganda and Coverup. This is true of the entire Western media, a collection of bought-and-paid-for whores." 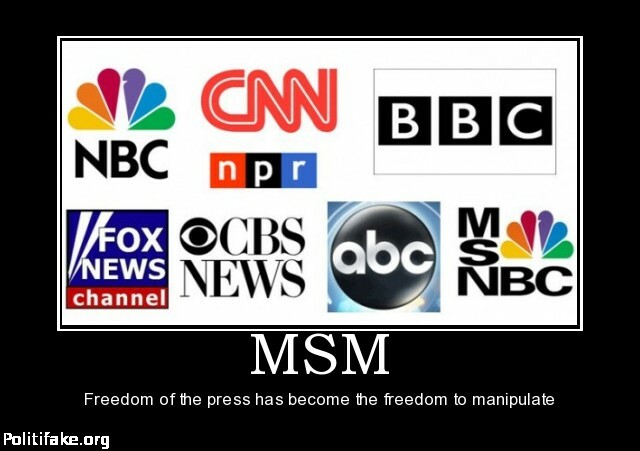 "The main stream media does what it is told to do. The reporters do what the owners tell them to do or they don’t get paid. The managers and owners are owned by corporation/advertisers which allow them to pay for the rent/mortgage, lights, supplies and the reporters--so the corporations will do one of two things...hype the event to a certain extent under their control to sell a product or service or tell the MSM not to report or under report on the issue so the event does not cause the reader/listener to re-evaluate and change their spending habits. That is one level of why we the people do not get any real news. "Another level as to why we don’t get accurate news is the government, whose prime purpose is to be in power and control as much as they can. The government also has sponsors, advertisers or corporations that pay certain individuals in government positions to behave a certain way, to promote or discourage events or issues that would affect we the people’s behaviors which includes, financial decisions, voting and contributions to politicians among other personal choices we the people make which would make my explanation to long. "Deeper levels include NWO-New World Order issues, satanic control, financial control by individuals beyond our human reach. The deeper levels have many arms and ways to control individuals within the different governments across the globe that control the media and then we the people." "These individuals are chosen because they control others through various means...financial, and fear of losing something they care about; [these] are the main control methods for people who would not normally get on board, but we have to look at those that jump in with both feet because of greed and desire to be a part of the darkness. I’ve simplified the explanations or this could be a book." "I spent about 15 years in the media - first in Hollywood and then 8 years in news production at CBS, ABC and FOX affiliate TV stations. It is really easy to control the news because all the proposed stories go through just a couple of point people designated as the "News Director" or the "Executive Producer" who have the final say on what hits the air. Consider Operation Mockingbird. "I used to keep an email folder of all the stories I proposed. I always got the same response of "That's interesting" and never a follow up. It didn't matter how much documentation I could produce, they just would not touch certain topics. "Further, all the national and international news reported in the US comes from the top down in a pyramid fashion : All local news stations subscribe to the 'CNN Feed' that provides story summaries with video and the 'AP Wire' that does the same. So most of the newscast is pre-packaged, and then the local stations re-write it for their anchors to report, plus add in the local stories in their respective markets." F. William Engdahl's book, Full Spectrum Dominance: Totalitarian Democracy in the New World, describes how the US has a long-term goal of dominating and controlling all parts of the planet: land, sea, air, space, outer space and cyberspace. Their methods included control of propaganda, use of NGOs for regime change, Color Revolutions to advance NATO east, and a vast array of psychological and economic warfare techniques. The extent of their media dominance today is illustrated below.